The indigenous people of Easter Island, the Rapa Nui, experienced a societal collapse after the 17th century because they stripped the island clean of its natural resources. Or at least, that’s the leading theory. An analysis of the tools used by the Rapa Nui to build their iconic stone statues suggests a very different conclusion, pointing to the presence of a highly organised and cohesive society. Located 2,300 miles (3,700 km) west of Chile, Easter Island is one of the most remote places on Earth. The 66-square-mile (170-square-kilometre) island was first inhabited by a group of Pacific Islanders between 1,100 and 900 years ago, with these people forming the backbone of a civilisation that would last for hundreds of years. The Rapa Nui people are famous, of course, for those stunning humanoid statues known as moai, the tallest of which measure 33 feet (10 metre) high and weigh upward of 81 tonnes. To reach this conclusion, Simpson and his colleagues studied the stone quarries from which the Rapa Nui people collected their raw materials, namely volcanic basalt, to construct tools like picks, chisels, and toki, an axe-like implement. These tools were used to sculpt the moai sculptures and to carve canoes, among other things. 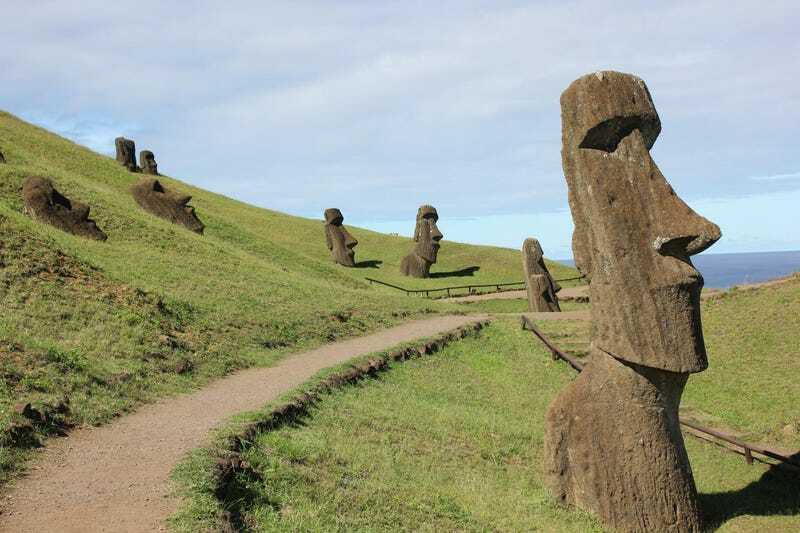 The researchers also analysed 17 tools selected from the 1,624 items recently excavated near the location of the moai statues. The researchers were trying to determine where the raw materials used to manufacture the artefacts came from, and to see if these people were extracting the material close to where they lived. To do so, the researchers cut off tiny pieces of stone from the toki using lasers, and used a mass spectrometer to analyse the different chemicals found within these samples. The chemical elements in these basalt samples were then compared to materials found within several other major quarries on the island. [We] argue that [the] purposeful caching of toki and picks—including the 1,624 specimens recovered around [the moai statues] does not represent a dramatic abandonment of moai carving as has been proposed and linked to the island’s alleged ‘collapse,’ but instead highlights that [ancient statue carvers] were well organized and planned ahead by having a surplus of necessary materials on hand and ready to use making Rano Raraku a highly productive megalithic quarry; hence the production of 1000 moai. Simpson and his colleagues believe it’s unlikely that the Rapa Nui civilization ran out of resources and fought amongst themselves to the point of extinction. “There’s so much mystery around Easter Island, because it’s so isolated, but on the island, people were, and still are, interacting in huge amounts,” said Simpson. This society was later decimated by colonists and slavery, he said, but Rapa Nui culture has managed to live on. “There are thousands of Rapa Nui people alive today—the society isn’t gone,” he said. Needless to say, more archaeological evidence is needed to paint a clearer picture of this civilisation and the reasons for its eventual demise. Revealingly, the researchers admit that their interpretation needs to be viewed with caution. Featured mage: Dale Simpson Jr.